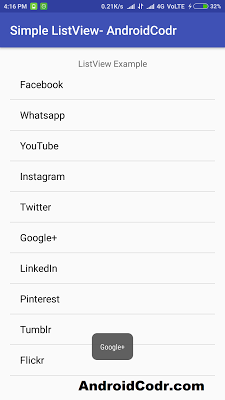 You have seen list of element in any mobile app where user scroll through list and select item from list. In this post we will see how to use ListView. How to select item from list. 4. I used package path as com.androidcodr.listview click next. 11. now drag n drop listview from palette below the textview. set its property as follows. 13. now in OnCreate method. 14. now we will define a String array which containing social sites/apps. 15. now we need adapter which will binds our string array to listview. 16. in constructor pass context this as first parameter. 17. this is by default layout for listview with single elements. we will see how to use custom layout for listview in next posts. 18. pass String array as third element. 19. now use setadapter method to bind this adapter to list. 20. Our list is ready you can build project and run. 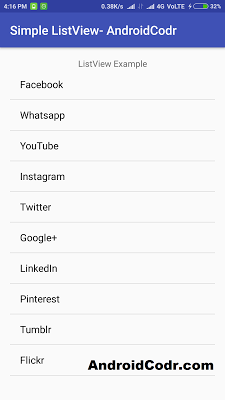 see out list of social sites/app is now visible. wait if you click on any element nothing will happen. lest see how to get selected item on click. 21. use setOnItemClickListener for listview. here we stored adapterview .item at position in selected string variable. 23. use toast to display this selected item to user. 24. again build and run project. a toast message is now showing selected item name.